New Hepatitis C Pill Promises Faster Treatment, At A Higher Cost : The Two-Way The new product brings several advances, but it also has a steep price tag, reported at $1,125 per tablet. Its maker reported billions in sales of a related drug approved last year. The FDA has approved a once-a-day pill that combines two drugs to treat hepatitis C, the deadly virus that attacks the liver and is believed to infect 3.2 million Americans. "The treatment, made by Gilead Sciences, bypasses the need for any injections or older drugs that have serious side effects. "The therapy is called Harvoni, and it combines two new drugs into a single pill that's taken once a day. Gilead says the pill cures more than 93 percent of patients, sometimes in as little time as eight weeks. "But the new drug is expensive. The cost will range from $63,000 to nearly $95,000 for a full course of the drug." 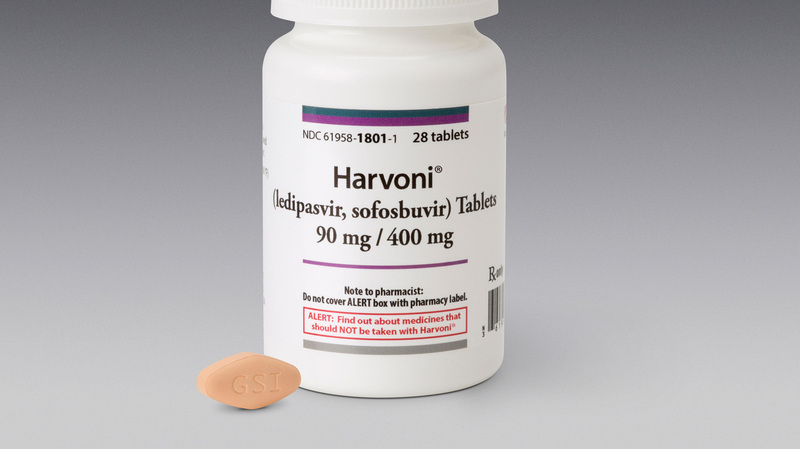 "By providing very high cure rates in as little as eight weeks and completely eliminating the need for interferon and ribavirin, which are challenging to take and tolerate, Harvoni significantly advances treatment for patients with the most common form of hepatitis C in the United States." The pill's maker reported billions of dollars in sales of a related drug that was approved last year. One of the components of Harvoni is that drug, called Sovaldi, which Gilead Sciences also makes. As NPR's Shots blog reported earlier this year, Sovaldi's $1,000-a-day price tag helped the company break a sales record for a new drug when it reported selling "$2.27 billion worth of Sovaldi in the quarter that ended March 31." "We didn't really say, 'We want to charge $1,000 a pill,' " Gilead executive Gregg Alton has said of Sovaldi's price. "We're just looking at what we think was a fair price for the value that we're bringing into the health care system and to the patients." In a follow-up post in May, Shots noted that Medicare had shifted its policies to cover Sovaldi, following hepatitis C treatment guidelines from the medical community. The move came days after NPR reported the story of an Arizona man who was on the verge of developing cirrhosis -– and couldn't afford the $150,000 Sovaldi and another drug would cost. A representative of the Centers for Medicare and Medicaid Services contacted NPR to say that changing the agency's coverage policies has been a slow process. Speaking about the new regimen yesterday, Dr. Edward Cox of the FDA's Center for Drug Evaluation and Research said, "With the development and approval of new treatments for hepatitis C virus, we are changing the treatment paradigm for Americans living with the disease."